Like most students of the Irish narrow gauge, the authors came to know of these little railways only after they had gone. Thankfully there was a band of enthusiasts attracted to these lines who committed their memories to print and picture, saving a flavour for those unable to have witnessed the railways at first hand. Transport museums and, more recently, preservation bodies, have also helped by salvaging some of the rolling stock. In recent years there has been increasing interest in the Irish narrow gauge among railway modellers, with an expansion in the number of commercial kits and products now available. The factual information contained in this booklet has been gleaned over the years from diverse sources including the many books and journals listed and discussions with many like-minded individuals. In compiling the various tables the authors have attempted to represent what they feel is the most reliable information. We are more than aware that differences of opinion exist and the passage of time makes access to original records more difficult. This work is not intended as a substitute for the many excellent books and articles on the subject and the reader is referred to a bibliography at the end of the book for a list of those available for the various railways. There is a concise history of each railway, along with tables of dimensions of the locomotives and rolling stock. Each chapter concludes with a chronology and a table of distances showing route mileage. The book is illustrated with photographs from the collections of Richard Casserley, R.W. Kidner, John Langford, R.W. Rush and W.A. Camwell. 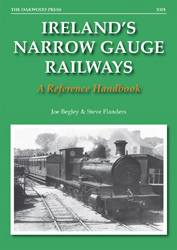 All royalties from the sale of the book are being donated to Irish narrow gauge preservation. A5 format, 160 pages, 58 images.